Any Sewage Water Work throughout the world will produce sludge, a form of biomass growing in the basins. This biomass has to be evacuated and is, generally speaking, difficult to handle! When liquid it has a dry matter of 3 to 4 %, or only 30 to 40 kg per ton of sludge. When mechanically dehydrated to 20 - 25 % dry matter, most of it is still water, on average 750 to 800 kg per ton of filter cake. This remaining water can only be extracted with thermal methods. The sun is our option! A mechanical dewatering system is additionally required before using the WendeWolf®, but these problems mentioned above are solved. The solar radiation warms the sludge's surface. The rise in the temperature forces the water molecules out into the surrounding air. The moist air transports the water and has to be evacuated. However, while the surface dries, the lower parts remain moist, and have to be turned. This is achieved by WendeWolf®, a turning and conveying machine mounted on walls, yielding a dry granulate of 10 mm as an average size. As the radial velocity is higher than the advancing speed, each time the drum turned the sludge is automatically moved from one end of the drying bed to the other. The drying bed is fed and emptied with appropriate equipment such as conveyor belts or shovel loaders but the transport through the bed is entirely automatic! The WendeWolf® moves and aerates up to 250 m³/h of sludge! The automatic programme ensures a continuous flow of the freshly pressed sludge through the drying bed. The required energy consists of electricity only, between 10 kWh to 30 kWh per ton of water evaporated. Industrial dryers require between 800 and 1000 kWh in thermal energy and electricity. Therefore the running cost of WendeWolf® is extremely low! However the system requires space to be built. As WendeWolf® is successfully used in the European climate, with an annual evaporation of 800 - 900 kg/m²year, we anticipate for example the double in the Middle East. When drying the sludge with the WendeWolf® , the volume decreases linearly to the water loss, thus leaving only 1/5th of the original mass to be evacuated. The original sludge is transformed into a granular bio-solid which is easy to handle and which can be stored in heaps, containers or bags. The granulate is odourless and if an agricultural use is permitted it can be spread with conventional machinery. 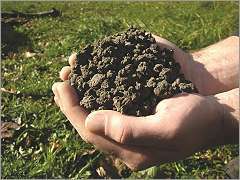 In Europe the reason for drying the sludge is the high cost of the final treatment, so each ton of water extracted from the sludge lowers the annual cost for the water plants. Solar drying requires space and initial funding, but the running costs are extremely low. WendeWolf® yields an end product which has the same high quality as industrially dried material but at a lower running cost. WendeWolf® installed in 6 countries in Europe and in Australia.